The war in the Cotswolds hit our activities hard today, rather limiting what we could do. It was wet, again. Yesterday too. When will it finally be summer? 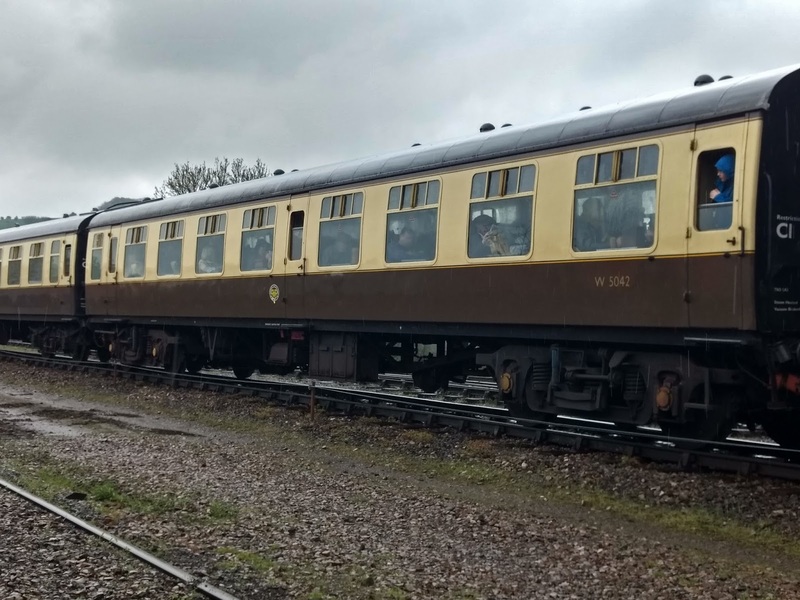 Today and tomorrow is our Wartime in the Cotswolds event, so the line was busy with 3 steam hauled rakes of 8 about, and the DMU on a shuttle to Broadway, after first doing a run to CRC. It came back packed. 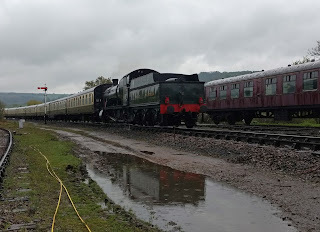 Motive power for the day was provided by P&O, Dinmore Manor and 2807. 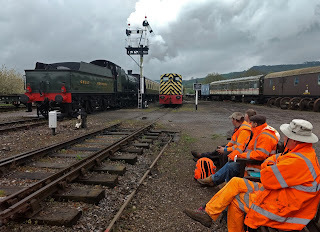 Here is 2807 just coming to a stop by the Winchcombe home signal, while members of the gang are sorting out the GUV. 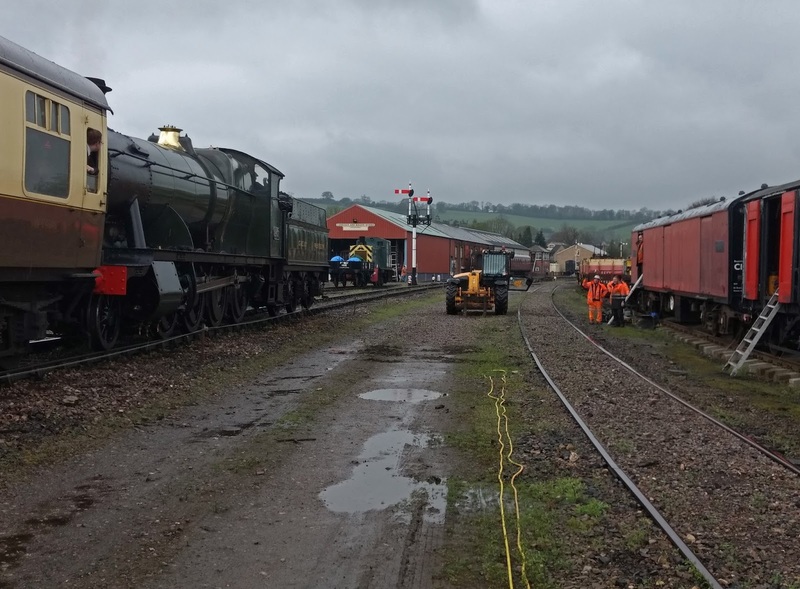 As we couldn't work on the track, we decided to have a day of sorting and tidying at Winchcombe. Sadly, our mess coach could not follow and with the whole of the Toddington station site taken over by the event, we had to retreat to Winchcombe and busy ourselves in the yard. The coaches were well filled, we noted. 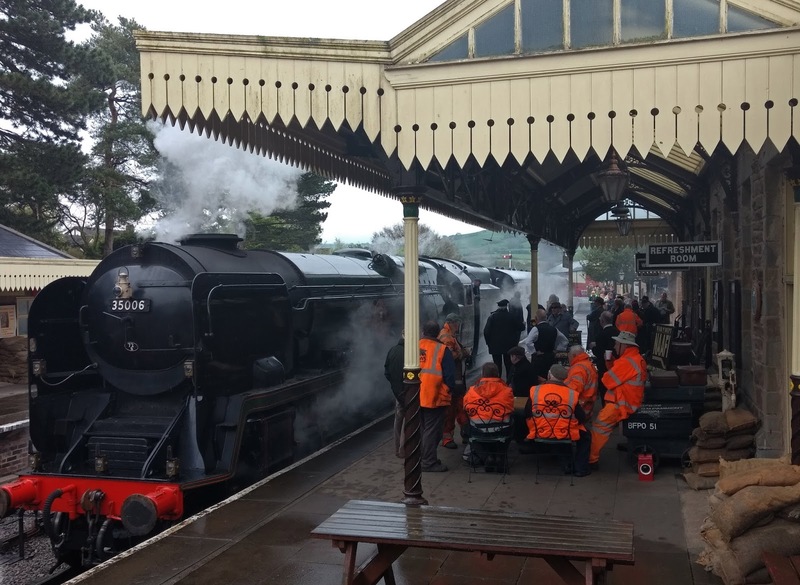 It was a good day for sitting in a train with a bacon butty and a mug of tea, and watching what others were doing in the rain. Every window had faces peering down at us. 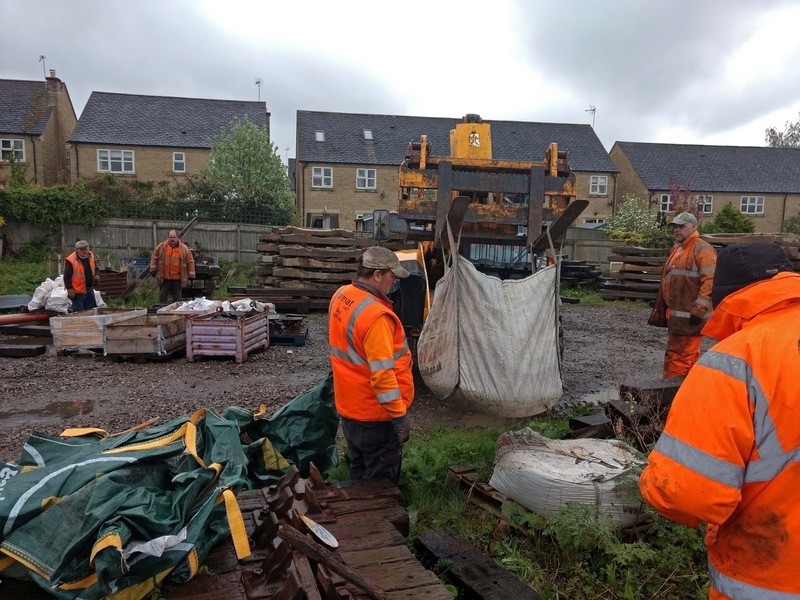 Meanwhile, we rationalised the yard, which had become a bit of a dumping ground after all the materials coming and going for the extension works. Bags had split, excess stuff brought back and dumped, fishplates separated and all mixed up. 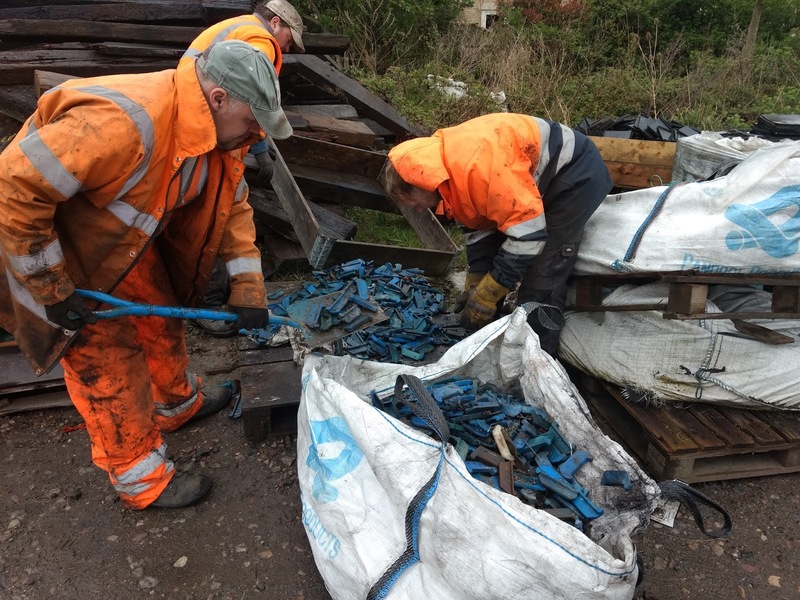 Here we are putting plastics into a dumpy bag. There are so many that it was found quicker to shovel them like sand. The camera continues to play up, today taking several photographs which then failed to appear in the gallery. 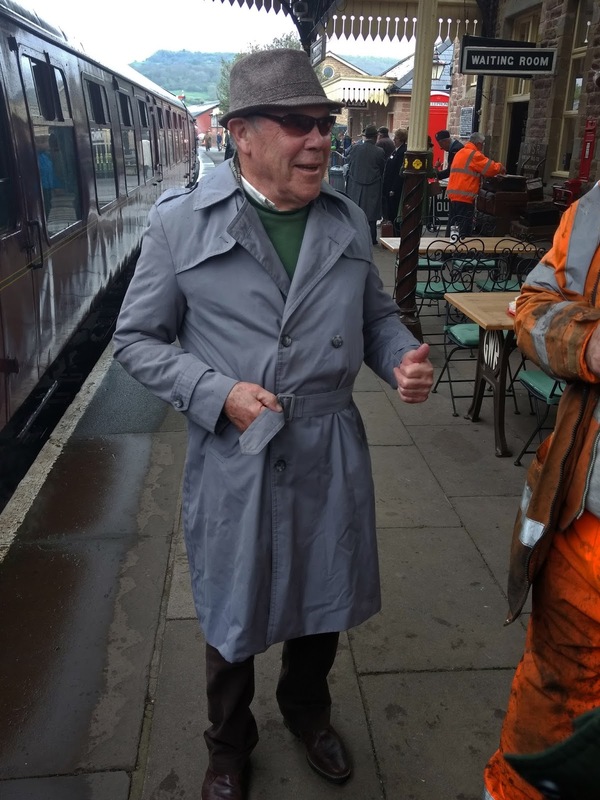 So one of the spy adding some bullet holes to the tail end of a 'shot down' Me109, and another of him scurrying along the Winchcombe platform looking furtive. Some of the ones it did please the camera to put in the gallery are now on this blogpost, so enjoy the little it gave. After a while an invisible whistle sounded, and we all trooped off in search of warmth, dryness, and tea. The Coffeepot had the promise of all three. As it was still early, there was room for us and we did not really inconvenience anyone (customers come first). Here we are camped outside the Coffeepot. We got the tea and the dry, but not the warmth. But at least you get a first row seat of the action. 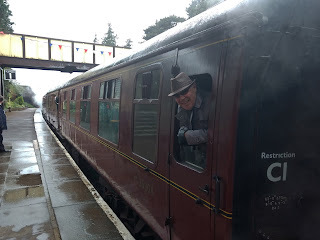 The station was very busy and we admired the ingenuity of some of the wartime paraphenalia. There was even a pill box, and a platoon of drilling soldiers (a platoon has 4 soldiers in it, right?). Seeing the drill in action, we wondered if it was alright for a soldier to scratch his nose while sloping arms... probably on a fizzer, that one. More practice needed. 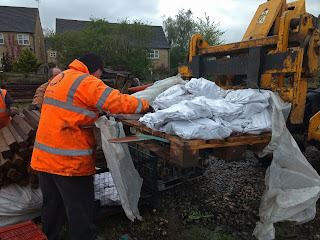 The tea got cold if not drunk immediately, so we threw it down and resumed sorting out the yard. Alan on the Telehandler shuttled dumpy bags about, and after a while we had a better idea that in future we would be able to find something, if we wanted say a pair of fishplates for a broken set. Lifter (specialist) fishplates are now in the GUV, and straight fishplates in the MOGO for example. Neil waved Alan close to this stillage of chair screws, but then complained that no one came to help him throw the heavy bags off the pallet. Well, we didn't ask Alan to stand this close, now us others can't get in, much as we would like to lift heavy bags of fishplates. Sorry, not our fault, the will is there though. Make do with that. 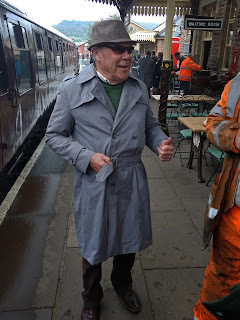 Zey vill not recognize me now, despite the GWSR jumper under my coat. There was a lot of hilarity when the spy - not wholly unknown in PWay circles - came to enquire if we knew of any tank or ammunition depots in the area. With the vital information carelessly leaked to him, the spy made off with a victorious smirk in a CRC bound train. 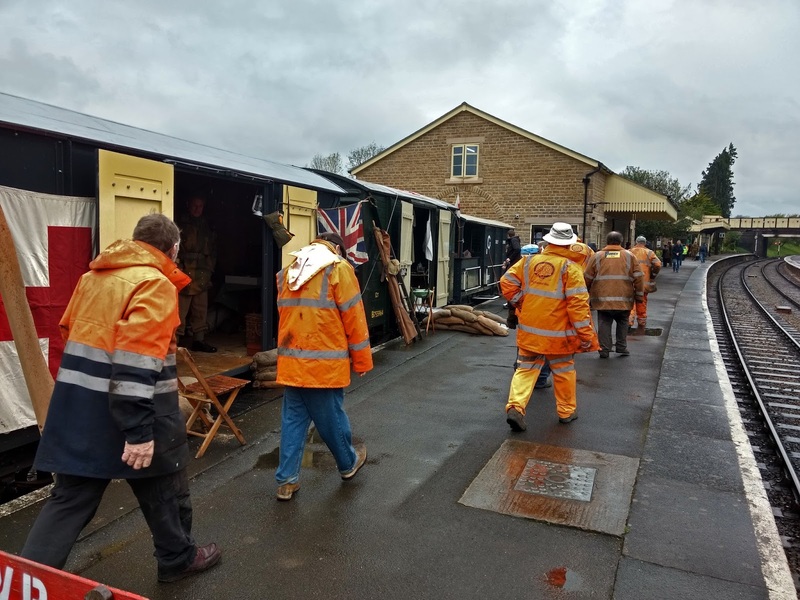 A war victim was found in the verrandah of a TOAD brake alongside the platform. He was quite convincing, and even showed a passing resemblance to our head of department, what with that bottle of intravenous Donningtons being infused into his arm. For lunch, no mess coach, just sandwiches and a ringside seat. We got damp from above, and indeed below, thanks to the wet bench. Except for Dave, who sat on a bag of fertiliser. Is that better now? 2807 in, Dinmore Manor out, there was hardly a moment's rest at Winchcombe today. Tokens were exchanged on the move. What a slick operation we are. 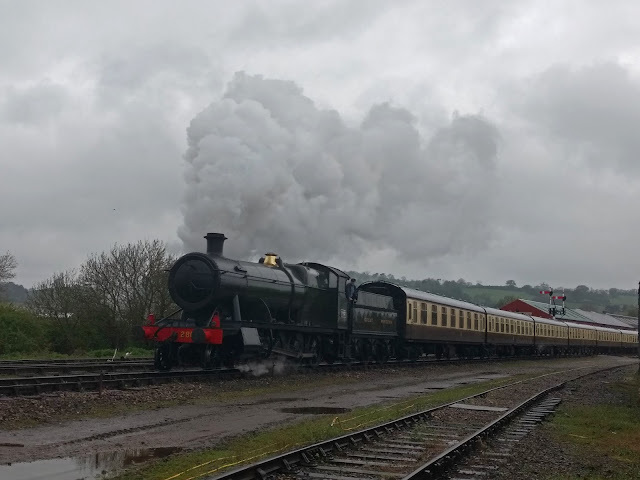 And off she goes again, Dinmore on her way out of Winchcombe past the carriage shed and our damp picnic. 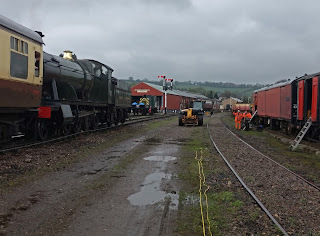 We packed up at about 3pm, after a last look round the yard for what might prove to be future work there. 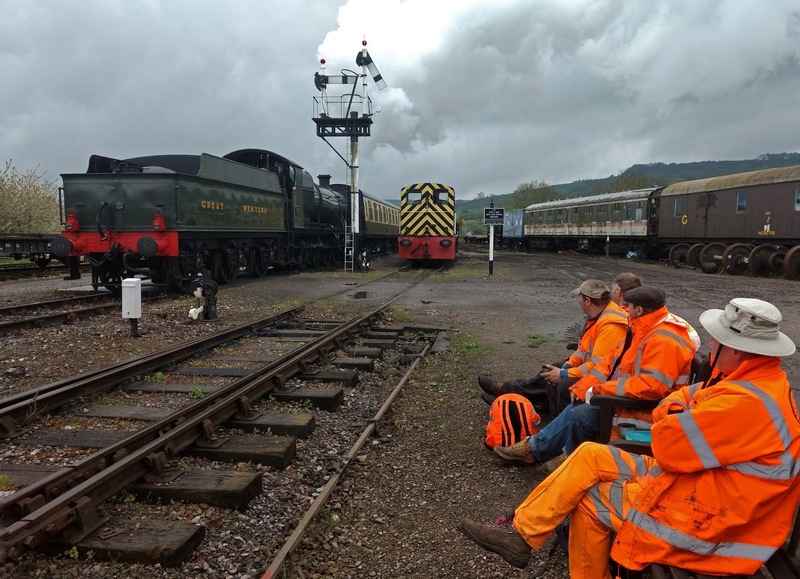 It's difficult to do work on the running line though, as there are no sufficiently long spots for us to do any more extensive work such as track replacement. That will have to wait until November. 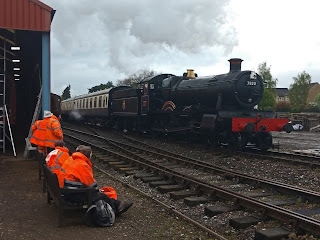 Here's 2807 just leaving the station limits with 8 on. Have to open the regulator a bit for that. Haven't we come a long way. 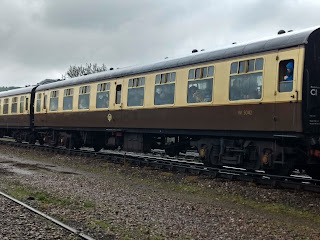 In the picture above the train is so long at 8 coaches that you can only see the first 6 in the frame. The heavy freight loco has real work accelerating this round a curve on slippery rail. 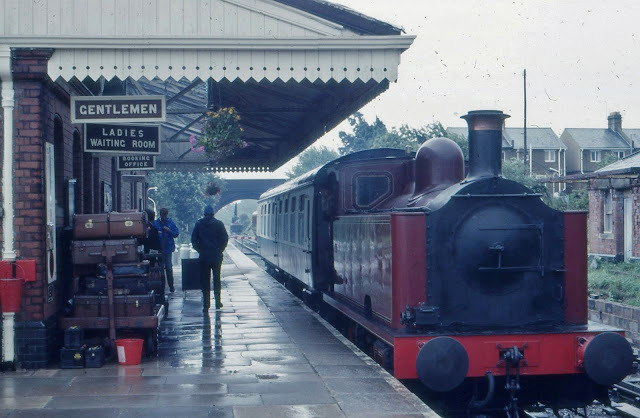 Now look at what we ran in 1985, half a year after opening. 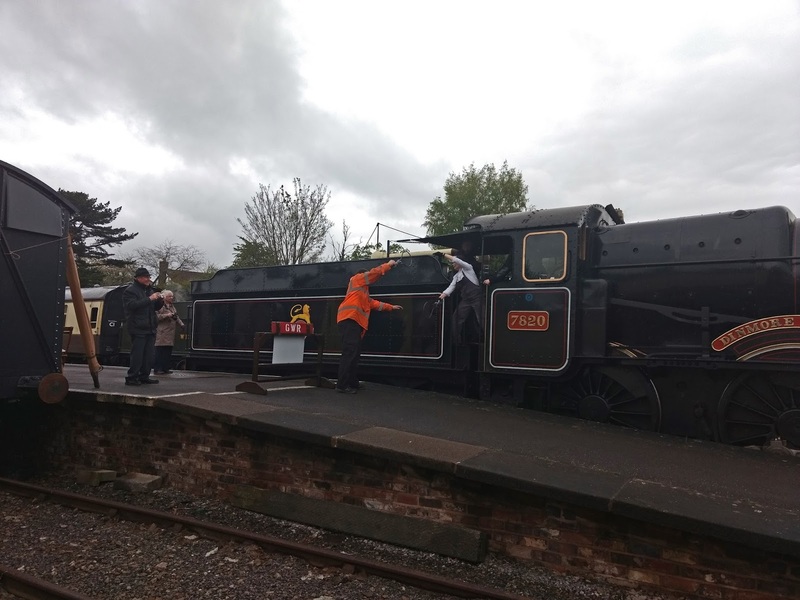 An industrial loco, with 1 on ! The weather, naturally, was the same though. We can give ourselves a big pat on the back, and bless those early day pioneers. Another rainy day, but there we have a canopy! No cafe yet though, we are working on that. Three of the 4 BEWARE of TRAINS signs are now up. We have also had an order large enough to do another production run, so if you are interested and want to join in, drop us a line at breva2011 (at) hotmail.co.uk. These production runs will be irregular, as we need a minimum total order of 4 to make it worth while taking the original back to the foundry. Here's the third cast iron sign, at the north end of P1. 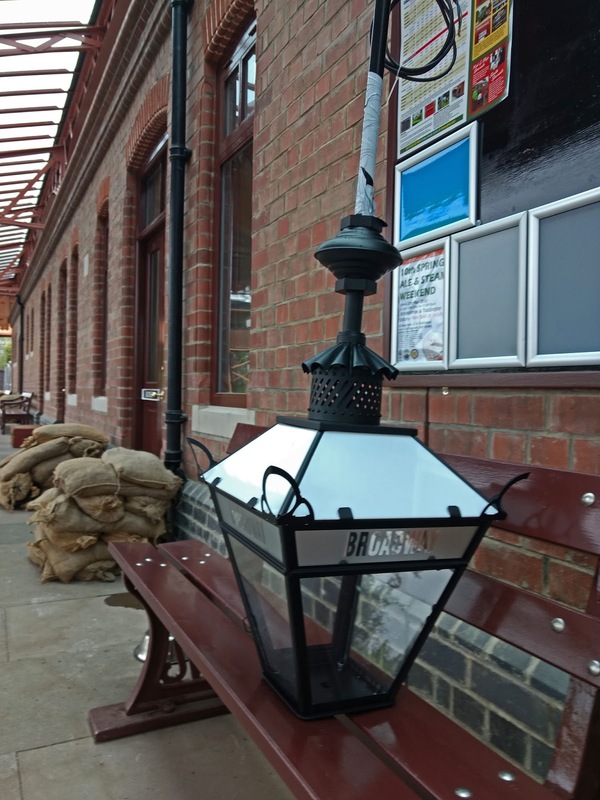 We still want to move one of the lamp huts to its original position by the footbridge steps, so this post has not been fixed in concrete, just in case it is in the way of the manoeuvres. Now, back to a bit of history. 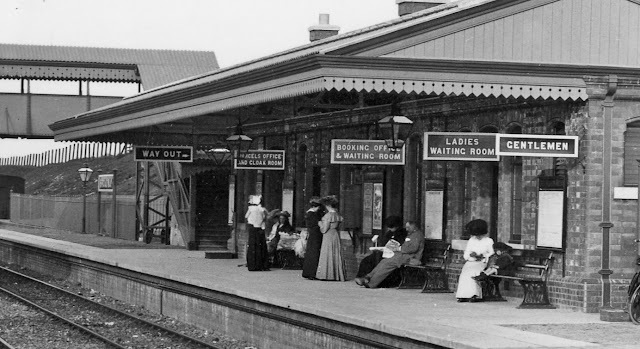 Here is that wonderful 1904 picture of all the ladies waiting at Broadway for their train to arrive from Honeybourne. 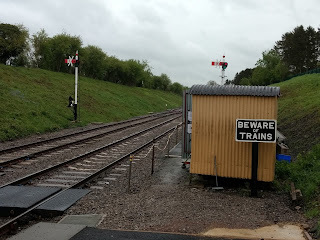 - GWR lettered poster boards. There is one on every available wall space in this picture. - The V boards over the doors. These are currently in progress. We will have, in the order on the picture, REFRESHMENT ROOM, BOOKING OFFICE, LADIES ROOM and GENTLEMEN. - The lanterns under the canopy. Good news on the latter, they have arrived! 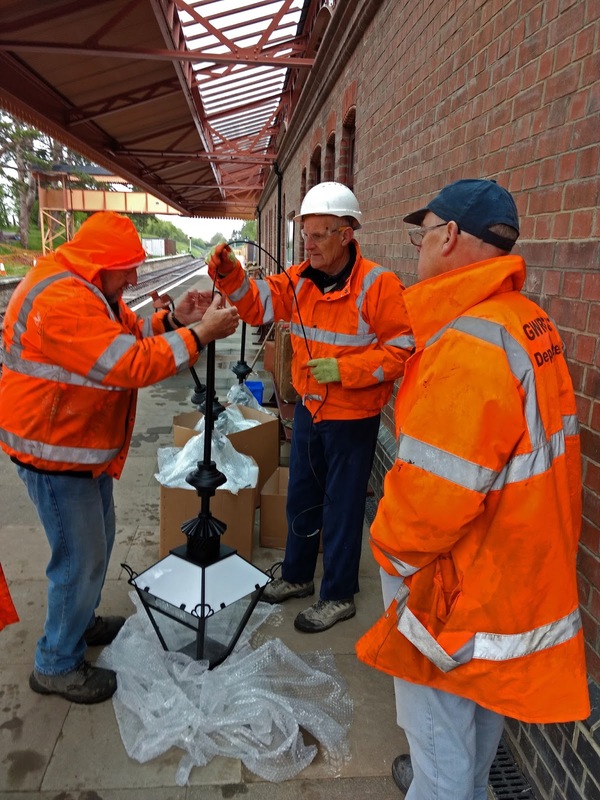 Thanks to a great supporter of the Broadway project we have been able to liaise with a heritage specialist and a hand made lamp workshop. After a lot of study of the above picture and others along our line we finally managed to work out the details. 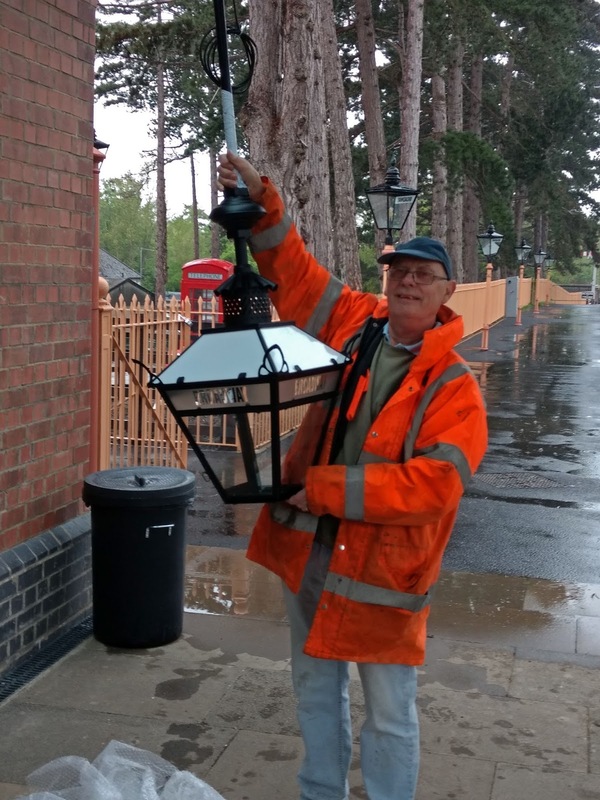 The lanterns have been faithfully copied, and fitted with an electric light inside. Real gas was a step too far though, and it appears that acetylene gas does not burn very cleanly either. The lamps include the gas pipe from above, a replica flexible joint in the middle and a beautiful little chimney on top of the white lantern glass. The station name BROADWAY appears in etched glass below. There are a total of 4 lanterns in this sponsorship, three for the main building and a fourth for the building opposite on P2. They are located between alternating trusses. They will be fitted Friday next week. The generous sponsorship also includes the manufacture of two larger hexagonal lamps. If you look carefully, you can see one at the foot of the steps, to the right of the WAY OUT sign. It hangs under the northern canopy extension. We now have an agreed layout for this canopy extension, which will provide a very welcome dry circulating area at the north end, very welcome in rainy weather like today's. The footbridge steps will end inside the canopy extension. We hope to make a start on the steelwork soon. The lamps look beautiful, and really looking forward to seeing them hung. I particularly like the little Art Nouveau flourishes on the corners. Will the illumination be some kind of gas-mantle disguised LED? I only got a glimpse of the shape, a sort of white, candle shaped bulb. It won't be orange, as can be seen elsewhere. Orange? I would have thought if it were to be any colour other than white it would be green! For that is the colour created by gas and Calcium Oxide powder or mantle. Thank heavens it won't be orange. St.Blazey has a point about the green tinge, though. Many years ago I had a repro station gaslamp on the corner of our house, and in order to make the light look authentic, I sprayed a very fine haze of pale green paint onto the bulb. It worked a treat, at least until one night some b****** nicked the lamp glass, and I couldn't get another one anywhere! Depends- gas under pressure like in a Tilly Lamp gives a very hard white light. Low pressure gas is much more yellow and softer. hard to do with an LED. Be fun to see what it looks like. So would there have been a small "gas plant" on the station producing acetylene to be piped to the various lamps? Bill's comment about LEDs is interesting. I remember when they came in only one colour - red. Then green and yellow and latterly (in the 1990s I think) in blue. White is quite a late comer on the LED scene. If you were really determined, you could probably make up a combination of red and yellow LEDs to give that dull orange gaslamp glow. However, given the number of times they will be used, it probably isn't worth the effort! 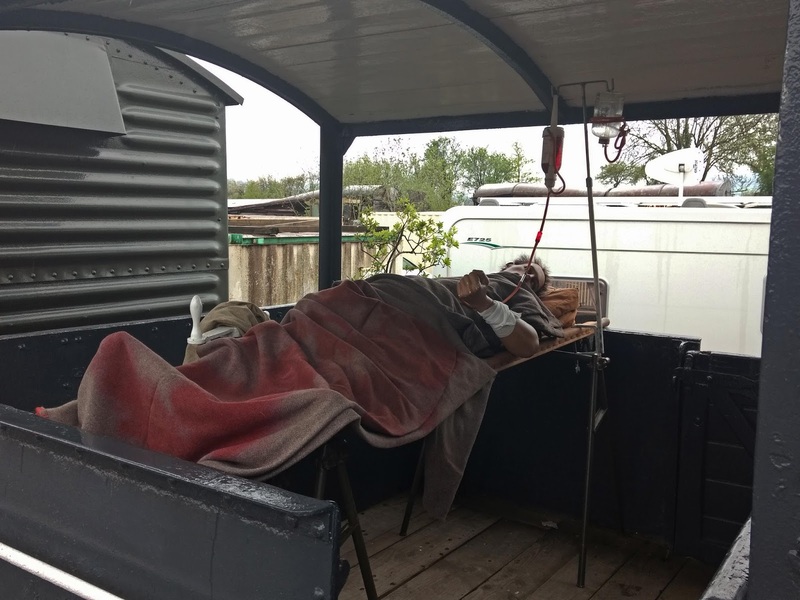 There was an acetylene hut in the goods yard, the same as on the other stations, except that of course at Broadway it was on the other side of the road, which seems quite a long way away. We have no idea how the inside of the building was lit, so went for an oil lamp for the booking offic, the most likely method. I suspect acetylene was not used indoors. You PROBABLY could use real gas lights- I think Beamish Museum 'Up North' have them. Downside is they aren't very bright, you would need a gas supply and most of all H&S would stick their oar in big time!